Since their inception ten years ago, Italy's Overtures has had some better than modest success within their home country and across Europe. They arrive in 2013 with their third album Entering the Maze, recorded and mixed by vocalist Michele Guaitoli and mastered by the legendary Sascha Paeth. Overtures: look out for the train. Entering the Maze is another case of an album that gets off on a rocky start, but quickly rebounds and grows on you. First, this is rather typical European melodic heavy power; it's spirited and entertaining, but not necessarily all that novel. The Maze begins the album and, at first listen, you might think that Overtures is going after progressive power metal with some of the mild tempo changes. But it's mostly heavier power metal, with a melody that's difficult to catch making it seem more busy than anything else. But beginning with second track, Under the Northern Star, Overtures finds their groove, especially when they develop that melody and a crisp chorus. That latter element comes to the fore in Of Nightmares, which has the feel of a heavier, even thrashier, Edguy. Later, Empty Trails reminds of an edgier Supreme Majesty (if you remember them) song. So the album eventually grows on you and keeps you interested enough not to stab at the skip button. Other notable songs are In the Middle of Nowhere, something between metal ballad and anthem, the staccato arrangement of Programmed to Serve, and the closer, The Oracle. Possibly the signature song here, The Oracle is Overtures doing melodic power metal at it's epic best: a grand arrangement with varied movements. 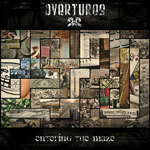 All in all, Overtures's Entering the Maze is a solid release, a good mixture of melodic and heavier power metal in the European tradition. If you like this genre, check them out. I think you'll be pleased. Recommended. All in all, Overtures's Entering the Maze is a solid release, a good mixture of melodic and heavier power metal in the European tradition. If you like this genre, check them out.